Automatic check-ins go out to your team on a regular basis. You can send them daily, weekly, or monthly. Everyone in the Project or on the Team or Company HQ Site can see the responses. 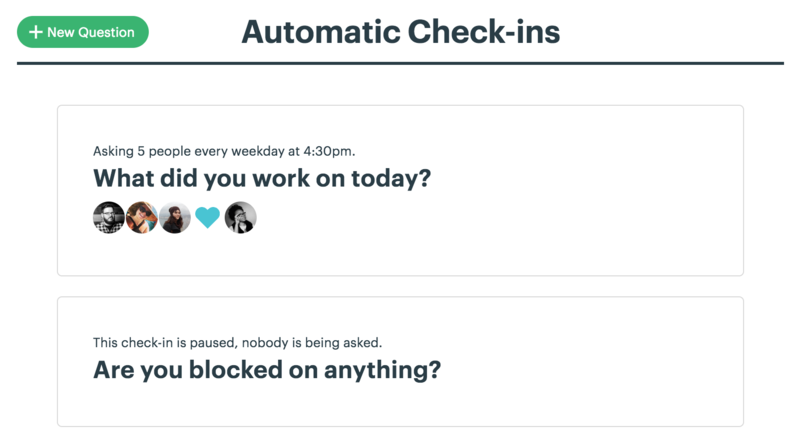 Automatic check-ins keep teams up to date, and help your users get to know each other better. At Basecamp, we use automatic check-ins to find out what everyone is up to. Every day, we ask people what they're working on, and what they had for lunch. Once a week, we ask people to take a picture of what they look like that day. Every other Monday, we ask people to share a good recipe. Once a month, we ask what people are reading, because who doesn't need a recommendation for a good book? To set up an automatic check-in, click the Automatic Check-ins card in the Company HQ, Project, or Team site and click to Set up an automatic check-in. 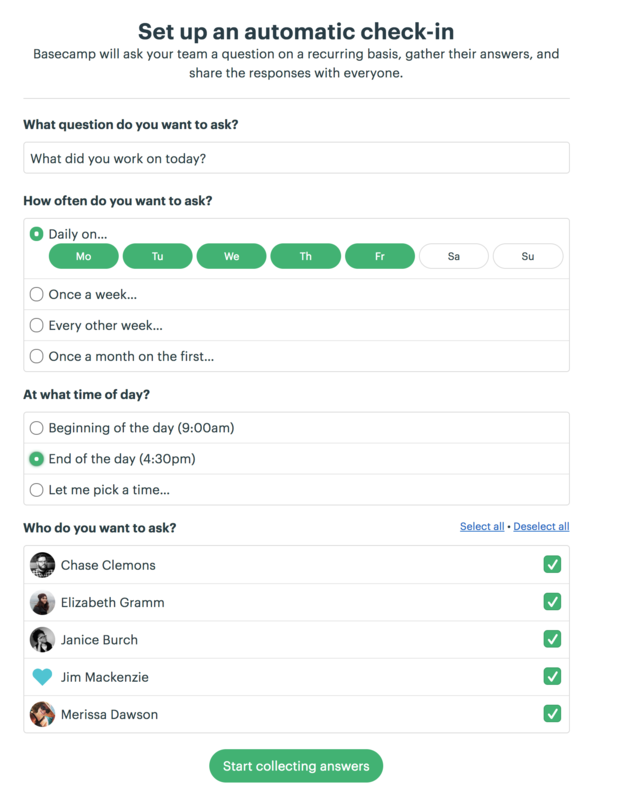 Type your question, select who should be asked, then select how often and at what time you’d like to ask it. When it's time to answer an automatic check-in, you'll receive a notification. Go to the check-in and click Edit from the ... menu in the upper right corner. If you don't need to be asked a check-in question, or don't need to see other people's answers, you can unsubscribe! To stop being asked a question, click into that question and look for the link "Stop asking me." You can also toggle between being asked (or not) from the menu for that question. 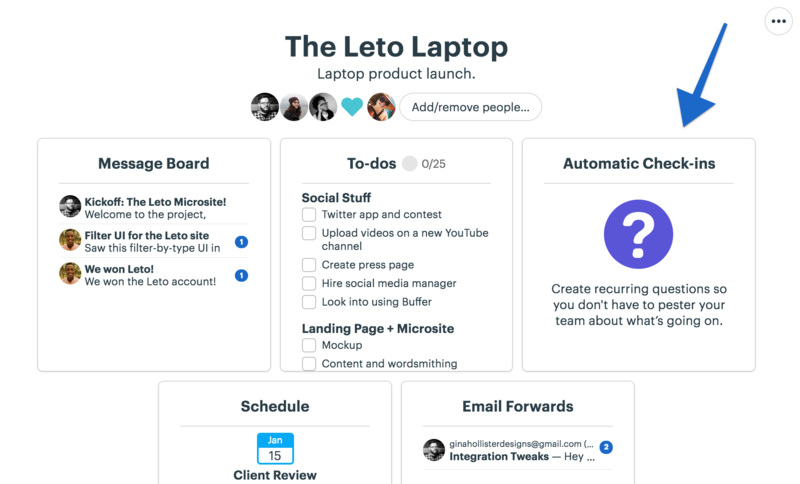 Look for the ... menu in the upper right corner and choose whether to start or stop being asked that question. You cannot start or stop other people from receiving notifications for a check-in. You can add or remove other people from being asked a check-in question. Adding someone to a check-in will automatically subscribe them to new answers on that question. You can hide a tool from a Project, Team, or HQ if it's not needed. See if a clear space really does organize the mind!